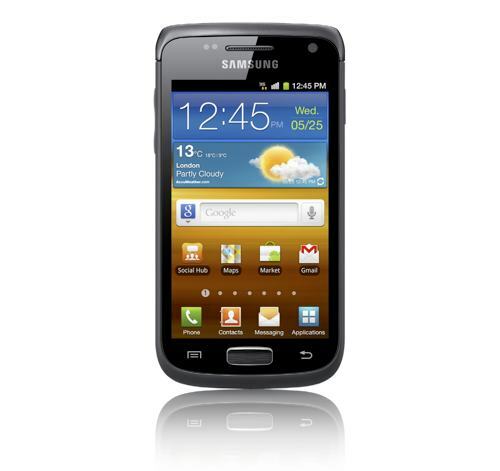 First up is the Samsung Galaxy Y (above). The “Y” stands for “Young” and can be seen as Samsung entry level handsets meaning affordable price with lower-end specs. This one in particular will be running on Android 2.3 Gingerbread, 832MHz processor, 3-inch 320×240 LCD display, 2MP camera, 7.2Mbps HSDPA and 1200mAh battery. Like all of Samsung’s new Android devices, it will offer support for Hubs, come with Swype pre-installed and feature TouchWiz UI. 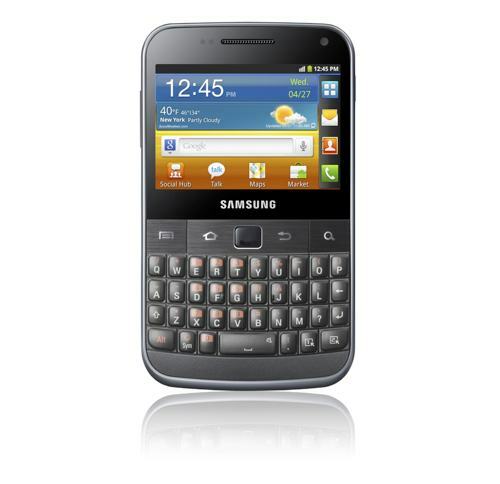 Next is is the Samsung Galaxy Y-Pro. Essentially this is the Galaxy Y with a full QWERTY in a Blackberry form factor. Not much other details were given on the device so expect the same internals, with a slightly different resolution screen. 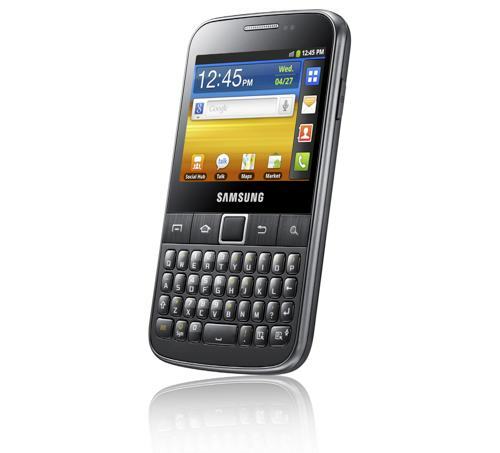 The Galaxy M-Pro is Samsung’s “Magical” mid-tier handsets designed to offer more power yet still remain affordable. The M-Pro has a 2.66-inch 480×320 LCD display, 1GHz processor, 5MP rear/.3MP front facing cameras, 1350mAh battery and running Android 2.3. Since this will be aimed at the business market, the device will come pre-installed with apps like Cisco Mobile, Webex, Sybase Afaria and others. And now we’ve come to the Samsung Galaxy W. According to Samsung’s handy chart, the “Wonder” devices are classified as their “high-tier” line of Android handsets. Like all the others, it will be running off of Android 2.3 Gingerbread and feature a 1.4GHz single-core processor, 3.7-inch 800×480 LCD display, support for 14.4Mbps HSDPA, 5MP camera and a 1500mAh battery. You can expect the typical Samsung software and the Galaxy W will also offer support for Kies Air which can be used to access the phone wirelessly using WiFi. So, that’s pretty much it from Samsung’s pre-IFA lineup. We’ll have to wait until August 30th before we learn more. Let’s hope Sammy unveils the Galaxy R and S tier of handsets and just maybe, they’ll give us some deets on that U.S. launch for the Galaxy S II. As always, we’ll be keeping you posted. SEOUL–(Korea Newswire) August 24, 2011 — Samsung Electronics Co. Ltd., a leading mobile phone provider, today announced a new naming strategy for its GALAXY range of smartphones. The creation of the new naming system is marked by the release of four new GALAXY smartphone, the GALAXY W, GALAXY M Pro, GALAXY Y and GALAXY Y Pro, all of which run on the powerful Android 2.3 Gingerbread operating systems. – “S” (Super Smart) – Devices at the very pinnacle of Samsung’s mobile portfolio. This class will only be used on flagship devices such as the Samsung Galaxy S, the award-winning smartphone that has already sold 10 million units throughout the world. – “Pro” – This indicates that the device includes a QWERTY keyboard for speedier email typing and increased productivity for professionals. – “Plus” – This indicates that the device is an upgrade from an existing model. – “LTE” – This indicates that the device is designed to utilize LTE (Long-Term Evolution) connectivity standards, a 4G standard to provide increased mobile network capacity and speed. Equipped with high-spec technology including a 1.4GHz Processor, HSDPA 14.4 Mbps connectivity and a large 3.7″ touch screen, the GALAXY W is the ideal solution for those who need to Live Fast and Live Smart. This powerful performance is enhanced with the inclusion of Samsung’s Game, Social and Music Hubs, providing one-stop solutions for a consumer’s gaming, socializing and listening needs. Kies Air enables additional control, allowing users who have misplaced their phone to track it, meaning complete peace of mind. Providing a strong performance for high value, the GALAXY M Pro is the ideal solution for young and sociable professionals. A QWERTY keyboard provides swift, accurate typing on the go – enhancing productivity when drafting memos, documents and messages. The keyboard also simplifies communication with Social Hub allowing users to talk to whoever they want, however they want, all from their contact list. Communication history, instant messaging and updates from social networking sites are all readily available.